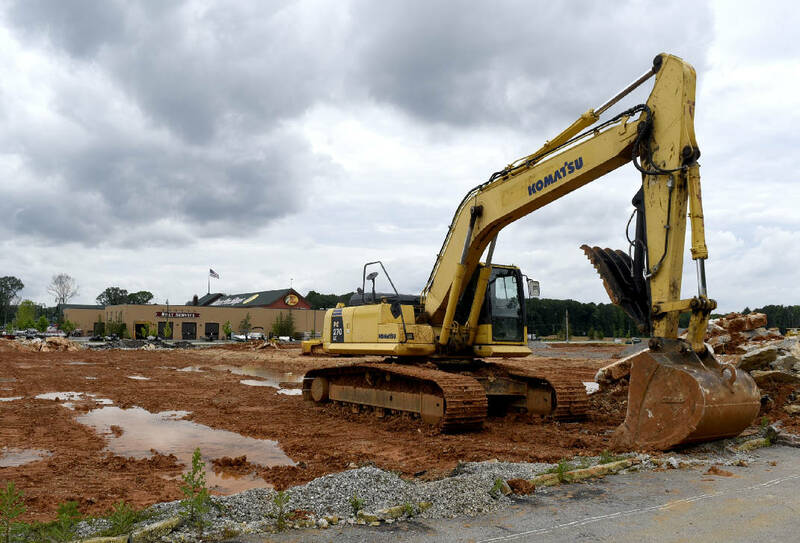 Idle construction equipment sits on the site of a new motel near the Bass Pro Shop in East Ridge. Nearly a year after one of the most coveted retailers opened in East Ridge, the Bass Pro Shop stands alone at Exit 1 in East Ridge. But developers of the retail complex on the southern most I-75 exit in Tennessee are hoping the start of construction soon on a new exit ramp and the recent start of construction of a new hotel will develop more of the site. Vision Hospitality is building a new 88-room hotel on the site of the demolished Ambassador Inn and developers hope more retailers, restaurants and other commercial businesses will follow. The city of East Ridge has already committed more than $11 million of taxpayer funds for the entire project, but a state law is giving much of that money back to the city in sales taxes. But the state sales tax only lasts for a while. Will the roads and sewers be ready and what is the outlook for one of the biggest new developments in East Ridge in decades. The site was photographed on May 25, 2017. Ditto for Jordan Crossing, the Bass Pro Shops-anchored retail center near Exit 1 on Interstate 75. Hailed as a boon for the city of East Ridge's bottom line, the construction of the shopping center with 300,000 square feet of retail, restaurants and hotels on 50 acres is subsidized through a Tennessee law meant to encourage retail development in cities just inside the state border. The center recently got a boost with the announcement that Chattanooga- based Vision Hospitality Group Inc. broke ground on an 88-room Hampton Inn there. "We are pleased to be developing another hotel in our hometown of Chattanooga," Vision President & CEO Mitch Patel said in a news release. "We truly feel that Hampton Inn is one of the best brands available today." But Jordan Crossing has been slow to bear fruit for East Ridge, since it's been hamstrung by two things: difficulty of access from I-75 and a limit on sewage capacity. In fact, the only way the new Hampton Inn could be built near Camp Jordan was to tear down an existing hotel — America's Best Value Inn — so its sewage use could be credited toward the new Hampton Inn. "When that hotel got torn down, those sewer credits got transferred over to us," said Andrew Hibbard, Vision Hospitality's vice president of finance and investments. Freeway access has been the biggest holdup with potential shopping center tenants, who have been blunt with Jordan Crossing's developers, John Healy and brothers Matt and Ethan Wood of Wolftever Development. "When you start the new intersection, come talk to us," is how Matt Wood described potential tenants' take on it. "The main issue that keeps us from filling this is traffic." But Wood thinks Jordan Crossing's fortunes are looking up. Construction is due to start in July, he said, on a new intersection that will come straight off I-75 and take drivers directly to Jordan Crossing, with two lanes coming in and two lanes coming out. "When you get off of I-75 coming north, you'll end up at this new intersection," he said. "It makes a brand-new entrance to the park." He said the intersection will be up and running right around the time Christmas shopping heats up. "We think the intersection itself will be finished at the end of November," Wood said. "It's about an eight-month project." The new intersection will be about 350 yards from the existing Exit 1, he said. The limit on sewage capacity also is getting fixed by the the Hamilton County Water and Wastewater Treatment Authority (WWTA), Wood said. "East Ridge has a sewer problem but we've been assured that the WWTA has a long-range plan," Wood said. WWTA Executive Director Mark Harrison said there is a state-ordered moratorium on new sewer connections in the area around Exit 1 because of the number of sewer overflows there. But WWTA has been working to fix sewer pipes to reduce the amount of infiltration and inflow from rainwater, which causes overflows. "We have done some work to secure some capacity out there. It's work that's been going on for several years," he said. "We're starting to see some success." Data collected by an outside firm shows improvement in infiltration and inflow, he said. Harrison thinks WWTA will be able to provide sewer service to new development at Jordan Crossing. "As they continue to build out, we'll probably be able to stay ahead of them," he said. "It really depends on what kinds of businesses they entice and how much water those businesses use. If they come in there and request 10 hotels, I might say I don't know if [WWTA] can handle that." The East Ridge City Council recently approved a $240,000 plan for new sidewalks, new lights and landscaping on Camp Jordan Road. The city has committed roughly $11 million to the development, including money for Camp Jordan Parkway improvements, construction of a new fire hall, acquisition of land from TDOT and site work on what once was low- lying forest near cranky Chickamauga Creek. "I do want to brag on East Ridge," Wood said. "They realized that was a problem and they worked on it to get that fixed." Contact staff writer Tim Omarzu at tomarzu@timesfreepress.com or facebook.com/MeetsForBusiness or on Twitter @meetforbusiness or 423-757-6651.